Orcas, Sea wolves, Blackfish, Grampus. One of the worlds most formidable predators, all the more so as they hunt in packs, orcas are toothed whales related to dolphins. Adult weight: males: 11.1 tonnes max. / females 8.3 tonnes max. Current world population: up to 100,000, the majority (70,000) in Antarctica. 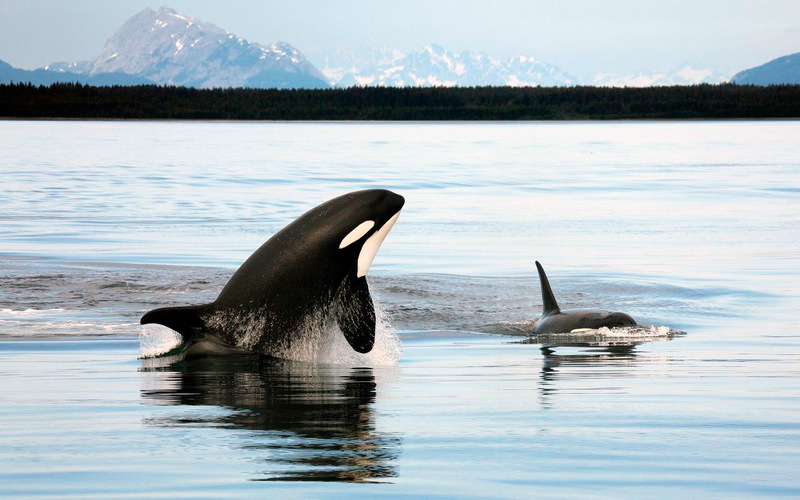 Orcas weren't targeted by whalers, threats are from interactions with fisheries and pollution. Not particularly abundant anywhere in its range. Killer whales or Orcas are probably the best known of the whales, as large carnivores they have a keen intelligence that enables them to be trained in captivity to do various tricks for rewards and so have been kept in marine aquariums and "Sea-World" type exhibits for many years. They are easily identified with their distinctive black and white patterning. 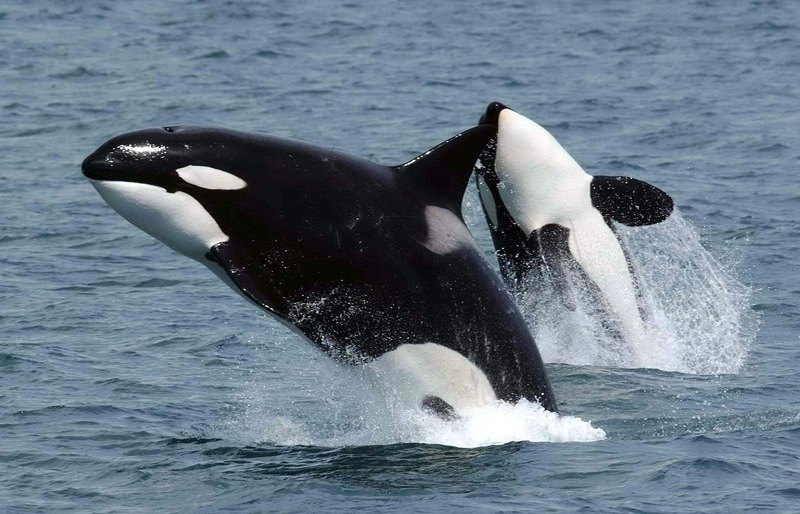 Killer whales are stocky in appearance compared to most whales which are quite long and slim relative to their length. Males are significantly larger than females (a trait known as "sexual dimorphism") and have a large and prominent dorsal fin (the one in the middle of their back) that can reach 6ft (1.8m) in height, the females dorsal fin is usually less than half this height. They are Odontocetes or toothed whales and while they are quite small compared to the great baleen whales (Mysticetes) they are at the very top of the Antarctic food chain due partly to their formidable array of teeth, but most of all due to the fact that they often hunt in packs or "pods". Their tastes are wide ranging from krill, squid, fish and sharks to penguins, seals and even the much larger baleen whales. Orcas are the largest of all carnivores on earth that feed on a wide variety of foods, they are found in almost all oceans, from the tropics to the Arctic and Antarctic where they will go deep into the pack-ice to hunt seals and penguins. They are commonest in coastal waters and in cool temperate and sub polar seas. They have very sharp stout conical shaped teeth, from 40-48 with equal numbers in each side of the upper and lower jaws. The teeth can be up to 5cm (2") long. 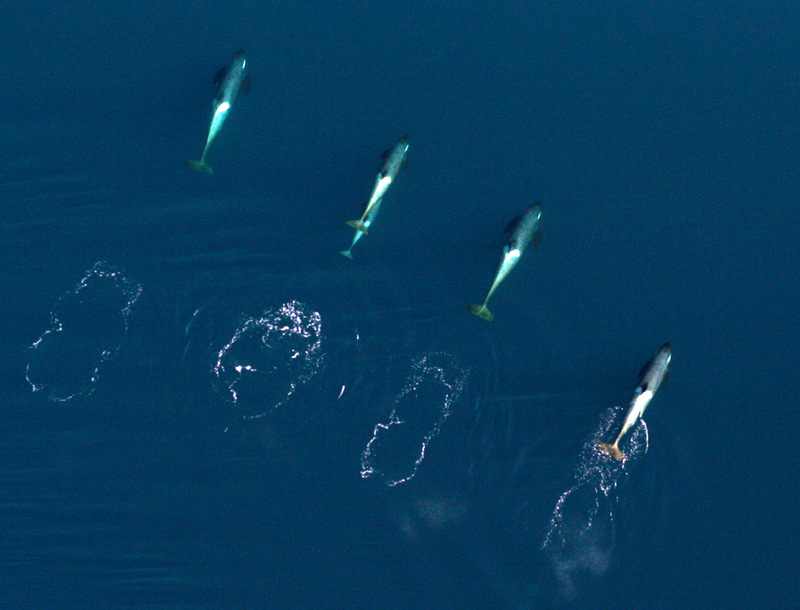 When a pod of killer whales is feeding, they will co-ordinate their movements by a continual stream of clicks and calls, though becoming silent in the final approach to intelligent prey such as seals. Ever ready to spot an opportunity, killer whales will even follow ice-breakers at the start of the season as they cut paths through the ice to reach deeper into the ice and perhaps get to seals and penguins that were beyond their reach. A male killer whale at the rear showing the charcteristic much larger dorsal fin compared to the female in the foreground. So adventurous and opportunistic are killer whales in this respect, that groups of killer whales are thought to have spent an entire winter living in and around a polynya, an area of open water kept clear by currents and winds while surrounded by miles of closed ice. These killers were unable to return to the open ocean as they would have had to have held their breath under the continuous pack ice for longer than they were able. In the days of commercial whaling, while Orcas weren't very much hunted themselves (they were much too small a catch to waste an expensive harpoon on), they would often follow the whaling boats and rush at the dead baleen whales that were being flensed or towed alongside the boat ready for flensing and feed on the carcass. As such, they were much disliked by the whalers as they competed for the prey that they had just captured. Not for nothing are these whales called the "wolves of the sea". Killer whales are very social animals living in family groups that are determined by the females of the group, so-called matrilineal groups. They form the most stable family groups of any animal species. Different groups have specific hunting techniques and even vocalizations that are passed down over many generations. It is likely, though not yet proven that there is actually more than one species of killer whale, so distinct are different populations. An interesting aspect of the ecology of Orcas discovered from studies of populations off Washington state in the USA and up to Alaska is there are three distinct types that are very similar but differ somewhat in coloration in morphology (the way they look / proportions etc.) but most of all in their behaviour. These three types are known as "Residents", "Transients" and "Offshore", they are discrete populations and little or no mixing between them appears to take place. Residents - These stay in one location all through their lives and form very stable communities. They tend to be mainly fish eaters which they are thought to catch with the help of echolocation. 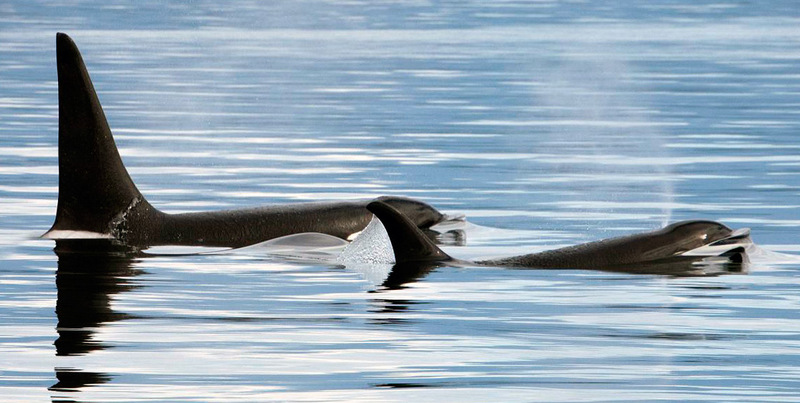 Their dorsal fins are more rounded at the top compared to the transients that have more pointed dorsal fins. Transients - Move around more, they tend to feed on marine mammals, mainly seals. They form pods with less members than residents and are not so loyal to a particular pod. Offshore - The least of all is known about these (as they live mainly offshore) but they form large pods and move following the edge of the continental shelves. Though these groups have only been studied to any depth in the North Western United States, indications are that the behavioural types exist elsewhere too such as the "Type C" population found in Antarctica. 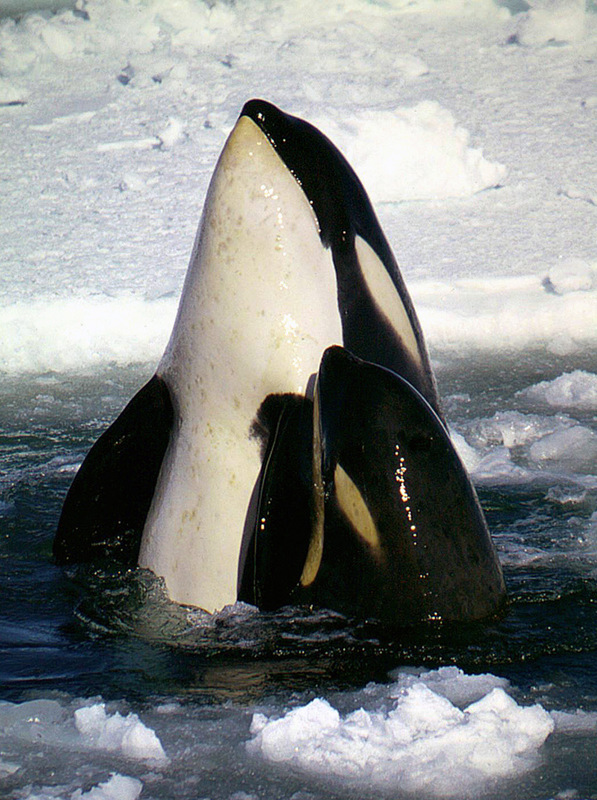 Type C orcas, identified by the sloping white patch near the eye, this is a calf with an older individual, probably the mother behind it. Type C's are a population that live in the Ross Sea in Antarctica, they are thought to feed almost exclusively on Antarctic cod. 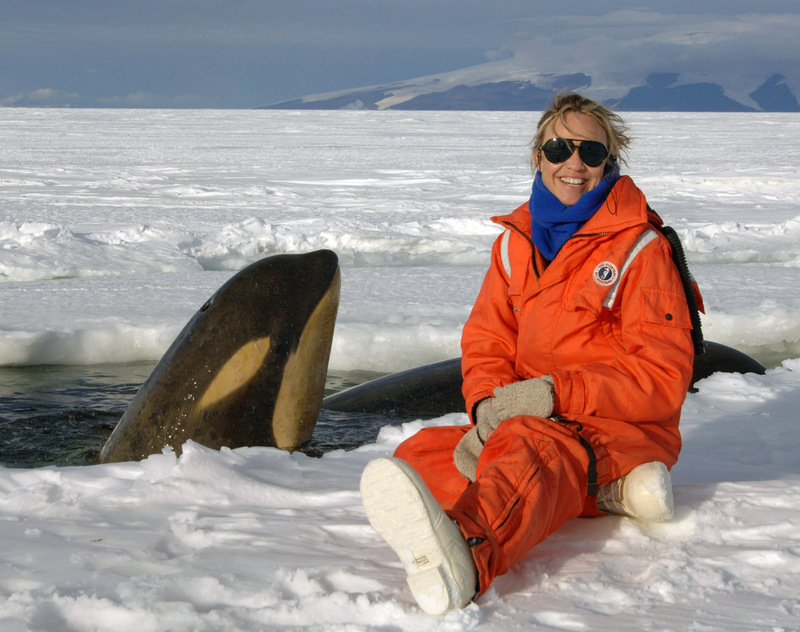 In the immediate foreground is a non-native Antartic species getting a whale selfie. Co-operatively herding fish such as herring together into tight groups and then slapping them with their tails to stun them. Otherwise a herring would be a lot of effort and a small mouth-full for such a large animal. Surprising young and unwary sea lions off the coast of Patagonia by chasing after them right into the shallows and then lunging with a great snap of their powerful jaws. Returning to sea after a near stranding in these cases takes quite an effort for the whale. Attacking the great baleen whales such as blue whale by tearing at and eating the great tongue which itself can be the size of an African elephant. A pod of 40 or so Orcas have been seen engaging in this behaviour attacking a solitary huge adult blue off the coast of California. Breaking through sea ice from below to surprise seals and penguins, or seeing them on ice-floes and then pushing upwards on the floe to tip the prey into the water. Alternatively two whales may rush at an ice floe which is then washed over by a large wave which dislodge the seal or penguin. Killer whales are often approachable by boats and are generally inquisitive. They are frequently active at the surface showing such behaviours as lobtailing, flipper-slapping, spyhopping, wave riding and breaching. Rubbing against a hard surface such as rocks or even other whales is often seen. It is thought to serve as a comfort movement and helps to remove dead skin. Certain rock rubbing areas may be socially important. Like all whales, sound is very important to killer whales. Researchers have even identified unique sounds and discrete calls that are distinctive to certain pods and family groups, to the extent that killer whale dialects can be identified. I was a little late on the scene this morning, and thereby witnessed a most extraordinary scene. Some 6 or 7 killer whales, old and young, were skirting the fast floe edge ahead of the ship; they seemed excited and dived rapidly, almost touching the floe. As we watched, they suddenly appeared astern, raising their snouts out of water. I had heard weird stories of these beasts, but had never associated serious danger with them. Close to the water's edge lay the wire stern rope of the ship, and our two Esquimaux dogs were tethered to this. I did not think of connecting the movements of the whales with this fact, and seeing them so close I shouted to Ponting, who was standing abreast of the ship. He seized his camera and ran towards the floe edge to get a close picture of the beasts, which had momentarily disappeared. The next moment the whole floe under him and the dogs heaved up and split into fragments. One could hear the 'booming' noise as the whales rose under the ice and struck it with their backs. Whale after whale rose under the ice, setting it rocking fiercely; luckily Ponting kept his feet and was able to fly to security. By an extraordinary chance also, the splits had been made around and between the dogs, so that neither of them fell into the water. Then it was clear that the whales shared our astonishment, for one after another their huge hideous heads shot vertically into the air through the cracks which they had made. As they reared them to a height of 6 or 8 feet it was possible to see their tawny head markings, their small glistening eyes, and their terrible array of teeth - by far the largest and most terrifying in the world. There cannot be a doubt that they looked up to see what had happened to Ponting and the dogs. The latter were horribly frightened and strained to their chains, whining; the head of one killer must certainly have been within 5 feet of one of the dogs. After this, whether they thought the game insignificant, or whether they missed Ponting is uncertain, but the terrifying creatures passed on to other hunting grounds, and we were able to rescue the dogs, and what was even more important, our petrol - 5 or 6 tons of which was waiting on a piece of ice which was not split away from the main mass. Captain Robert Falcon Scott, January 5th 1911, from: Scott's Last Expedition - The Journals of Captain R. F. Scott, R.N., C.V.O.